I just adore this time of year! Getting ready for Christmas, all the fun and traditions, the decorations, the music, the food..... so much good stuff packed into the last two months of the year. We found a new holiday tradition that I can't wait to share with y'all! 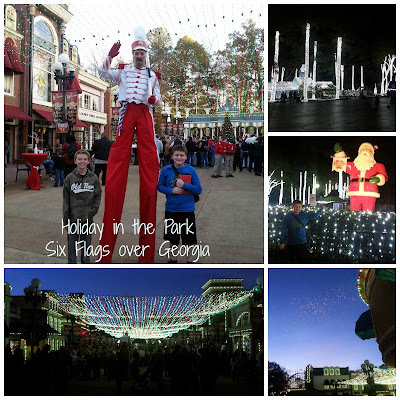 Did you know that Six Flags over Georgia is open for Christmas? It's called Holiday in the Park and it is fantastic! We went with our friends Tiffany & Seth, and it was great fun! First - the lights. Oh my goodness, the park absolutely transforms once the sunsets! There are millions of twinkling, glittery lights everywhere! And trees! It's just beautiful. The tree lighting was fun and a special start to our evening. After all, a Christmas-themed wonderland is not complete without a gigantic tree and a ceremonial lighting. The tree will be lit by U.S. Service personnel, along with their loved ones, at 6 p.m. each night of Holiday in the Park. There are so many areas to explore: A Main Street Christmas, Peppermint Plaza, Retro Christmas USA, Glohill, Holiday City, North Pole and more! You'll want to visit every place and see the sights! There are plenty of rides available during Holiday in the Park, too. My son isn't big on any thrill rides and coasters, but we did get him on the train and carousel this visit. And I rode the Harley Quinn Spinsanity again - it's my favorite!! 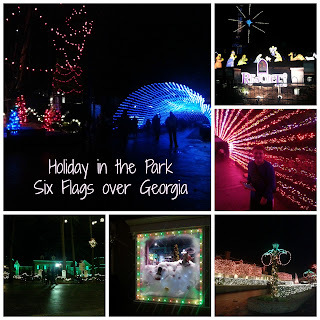 It is really neat to see the park all lit up at night from the rides! Make sure to visit Santa and Mrs. Claus, and you may even see an elf or two! There are strolling carolers, holiday music, even mistletoe in front of the Monster Mansion! So make sure you stop for a kiss from someone you love. There is plenty of yummy food and hot drinks for you to enjoy too. S'mores, peppermint funnel cakes...you will find all kinds of sweets, and different hot cocoas - try it with Peeps marshmallows! After your visit, you'll have to let me know your favorite treat from Holiday in the Park in the comments below. 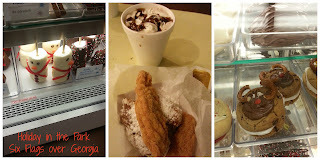 Our favorite was the chicken and beignets. So tasty! Plus a cup of hot cocoa with whipped cream. David also tried the mint fudge, and cheddar popcorn - both were hits! I hope you and your family will take some time to check out Holiday in the Park this holiday season, and make it a part of your Christmas traditions. It's really beautiful, and such a fun way to get your Christmas on! To find out the complete schedule, activities, and other information about Holiday in the Park, please visit this link. Disclaimer: Six Flags over Georgia hosted us at Holiday in the Park for an evening in order to experience the park, and write this review. No other compensation was received. Looks fun! And the food looks so yummy! Yes it is, and the food was amazing! How fun does this look! 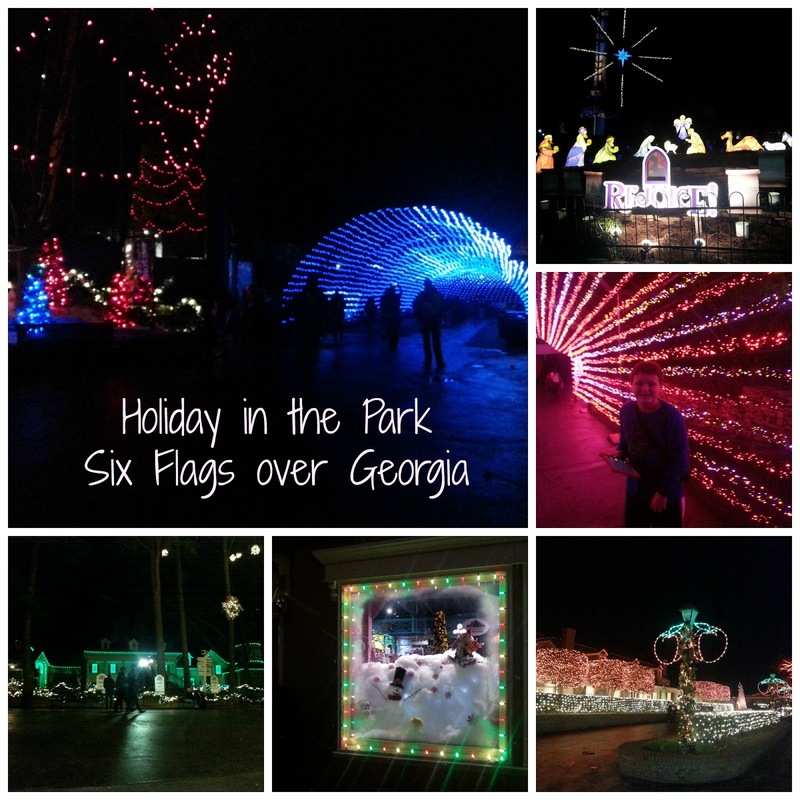 I love Stone Mountain especially at Christmas time!